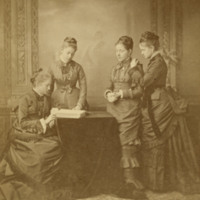 Photo of four women at a table. On the left side of the photo: two women, one seated and on standing, read from a book. On right side of the photo: two women standing. Inscribed on back: Mary Garrett, Bessie King(?). 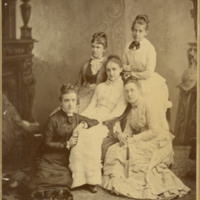 Studio portrait of M. Carey Thomas (seated on the floor), Mary Garrett, Julia Rogers, Mamie Gwinn and Bessie King.